The Victoria & Albert Museum is hosting their next Fashion in Motion event on December 11th. The star of the show? None other than Montreal’s very own, Erdem Moralioglu. Fashion in Motion is a series of live catwalk events at the V&A to bring couture to the common/everyday fashion lover, featuring some of the greatest modern designers du jour. The last show featured Giles Deacon. 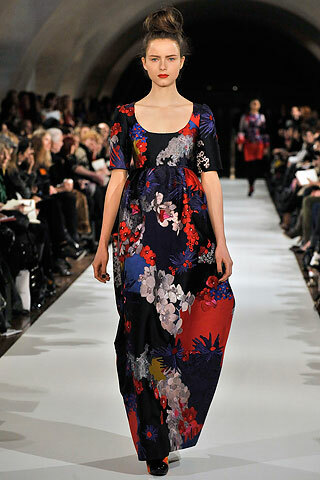 Erdem is no stranger to London – he studied at the Royal College of Art, graduating in 2003. He worked for Diane von Furstenberg for a New York minute, before returning to the birthplace of Mods and Punk Rock, to launch his own line in 2005. He is obviously inspired by artists from Monet to Degas to Kandinsky. The fusion of florals and blurred beauty is deliberate and intricate, but the results are simple. These dresses are easy to put on, easy to wear and easy to carry. Scoop, there it is. Erdem Moralioglu FW09. A little detail in the right place. Erdem Moralioglu FW09. It doesn’t matter if you are going to the opera, to a cocktail party or on a romantic tryst. A little Russian and a little French, all at once. Erdem Moralioglu FW09. Modern cheongsam? Erdem Moralioglu FW09. His dreamy dresses and positively pristine prints make you glad to be a girl. Glamour, fully zipped at Erdem Moralioglu FW09. Admission to Fashion in Motion is FREE but booking is essential. Tickets will be available to book from Monday November 30th. Call the V&A at: 0207 942 2820. Erdem FW09 collection images from Style.com.